Let's start with the news that finally after dithering for several years I bought an iPhone. Yeh, who cares? They are as common as muck, right? But could be the start of something new for the Phuket weather blog. I decided in 2013 that the weather blog did not need regular updates ... you can follow me on Twitter where the weather gets a daily mention, and there's also the Jamie's Phuket Facebook Page which also gets updated just about every day with photos or news or blog updates. 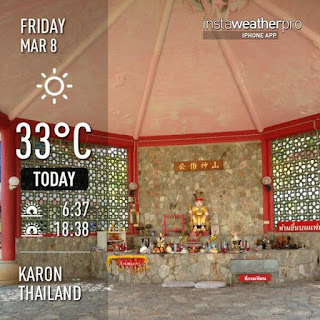 On this weather blog there's a great Live Phuket Webcam at Karon Beach or there are plenty of other weather links on the left side of this page. Now, with the iPhone there are several cool things that might lead to a daily weather blog update. Number 1. Instagram - apparently has 100 million users and now I am one of them. Please follow me on Instagram at instagram.com/phuketblog. It's a new toy for me right now, but I like the live aspect of it - here's the weather NOW! One of the first photos I took was on March 6th - sunset at Karon Beach. 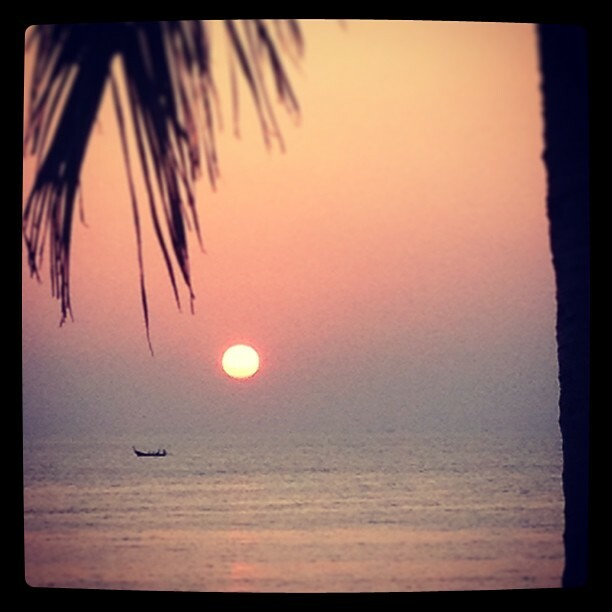 March 1st : A gorgeous sunny day in Phuket! 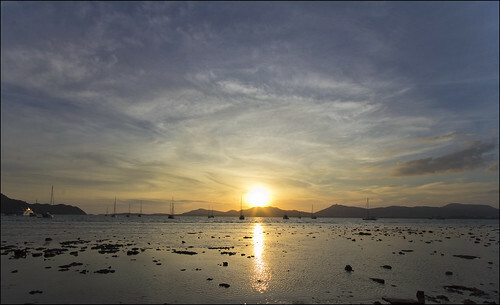 March 2nd : This morning's weather : Blue skies over Phuket, just as it should be. And this was the sunset on March 2nd. Nice. March 4th - let me just say first - happy birthday to me. 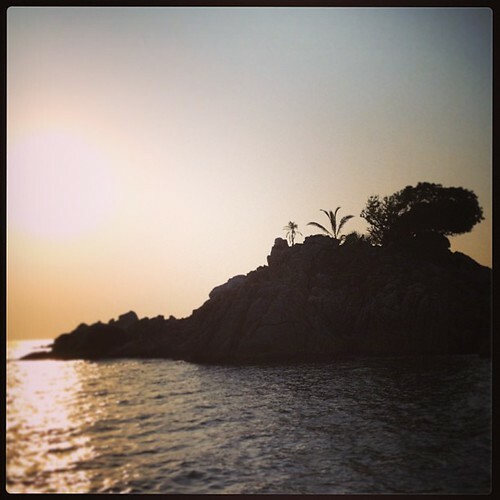 That was the day I bought the iPhone :) And on Twitter : Another perfect sunny morning here in Phuket. 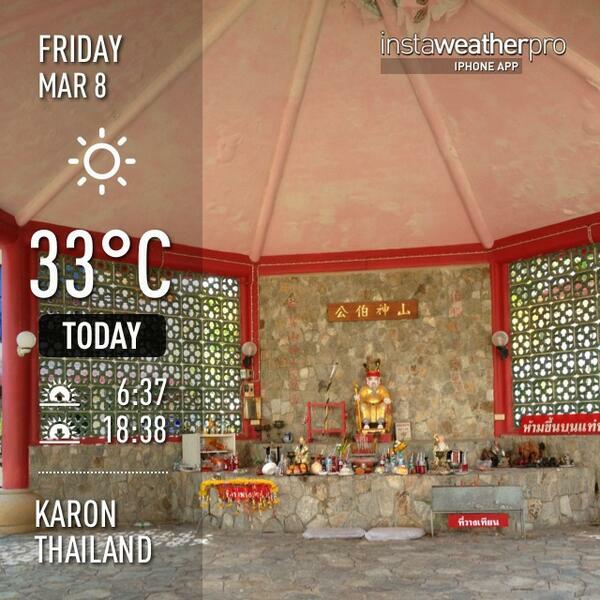 March 5th : It's going to be another hot, hot day in Phuket. That's the Chinese shrine outside Sunrise Divers at Karon beach. This Instaweatherpro app might turn out to be very useful. Although I am not convinced of it's accuracy. I tried using it yesterday with a clear blue sky overhead and it said "mostly cloudy". I think maybe a photo without robot generated info is better! 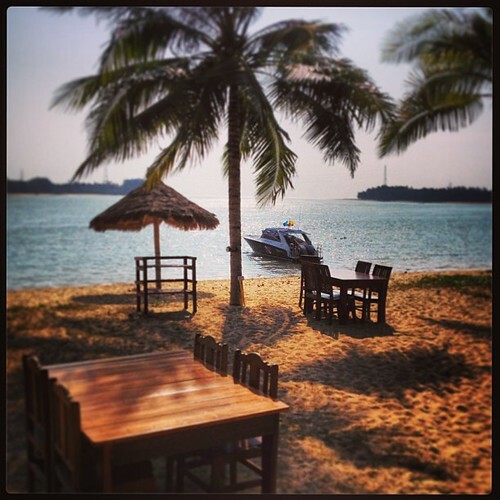 And a lunch break at Thanoon Seafood next to the Sarasin Bridge, and snorkeling at Koh Waew off Bang Tao Beach. The hot season is here. Yesterday on the boat would have been really hot, but there was a bit of wind blowing. 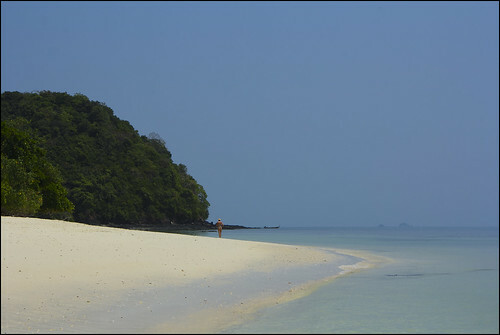 When the wind stops, then Phuket is hot! And that starts right about now. So ... I will try to figure the best way to update the weather with a photo from the iPhone, maybe daily, maybe a few times per week, but at the same time .. technology has moved on! For the latest Phuket weather news, please do check the blog, and please do follow me on Facebook, Twitter and Instagram. Goodnight from Phuket. March 10th, nearly 10pm and still rather hot outside!